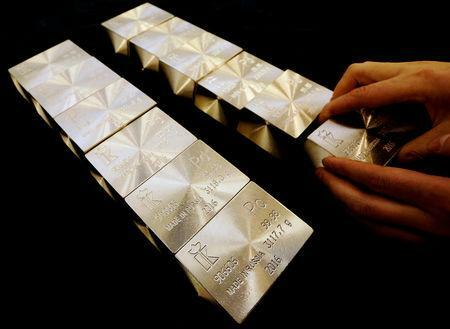 (Reuters) - Palladium surged past $1,600 for the first time on Tuesday, in a seven-session rally, on expectations that strained supplies of the autocatalyst metal could worsen, while platinum soared 3 percent. 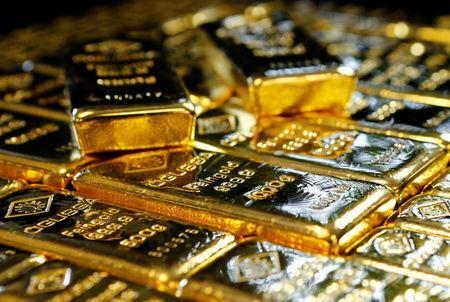 Gold and other precious metals gained off a weaker dollar as the Federal Reserve began two days of policy meetings, with market concerns about U.S. economic growth. Spot palladium rose 1 percent to $1,599.01 per ounce as of 2:37 p.m. EDT (1837 GMT), after hitting an all-time high of $1,606. "Palladium market is in a very tight situation and we are looking at deficits," said Bart Melek, head of commodity strategies at TD Securities in Toronto. "We saw some restrictions on Russian exports of scrap. Supply has been tight especially on the front end of the curve, and will continue to be." Compounding a weak supply scenario for palladium, Russia's trade and industry ministry is considering banning exports of precious metals scrap and tailings from the world's largest producer of the white metal. "Despite the recovery in equity markets, dollar weakness has supported the complex, but fundamental developments – such as Fiat Chrysler's voluntary recall – have continued to support palladium," Standard Chartered Bank said in a note. Last week, Fiat Chrysler said about 965,000 vehicles would be recalled in the United States and Canada for not meeting emissions standards, and have their catalytic converters replaced. While both platinum and palladium are primarily consumed by automakers for catalytic converter manufacturing, platinum is used more in diesel vehicles. Spot Platinum jumped to $855.33 an ounce on Tuesday, its highest since March 4. "At palladium's $1,600 level, platinum looks really cheap. Users of platinum will increasingly be looking to substitute palladium with platinum, because it is half the price and provides security of supply," Melek said. U.S. gold futures rose 0.4 percent to $1,306.5 per ounce. "Although investment demand has been at times subdued, gold priced around $1,300 tells you there is still some institutional interest," said Philip Newman, a director at Metals Focus. Lower interest rates reduce the opportunity cost of holding non-yielding gold and weigh on the dollar. Spot silver declined 0.4 percent to $15.38 per ounce. Does Dundee Precious Metals's (TSE:DPM) Share Price Gain of 58% Match Its Business Performance? Who Has Been Selling The Middleby Corporation (NASDAQ:MIDD) Shares? Investing In Stocks: Should You Really Sell In May And Go Away?